Manuel Antonio National Park is a small biological island. It was established in 1972 by the Costa Rican government who wanted to preserve the country's priceless wildlife. Though Manuel Antonio National Park is the smallest park in the country, it is the most visited due to its charming combination of rainforest, beaches, coral reefs and wild life. The fauna is diverse: there are 109 species of mammals and 184 birds. Among the most outstanding are the raccoon, the coati, the agouti, two-toed sloth, three-toed sloth, white-faced monkeys, howler monkeys and the Titi monkey, an endangered subspecies endemic to the park. You can also see bird species such as Toucans, pelicans, tanagers, ospreys, kingfishers and the yellow crowned night heron. It is also possible to see iguanas, lizards, snakes and countless varieties of insects. 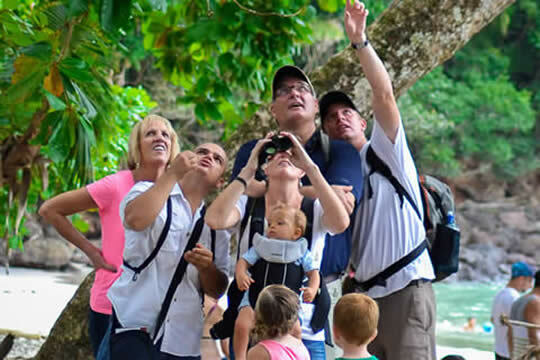 These are just some of the features of the reserve that make visiting Manuel Antonio National Park an unforgettable experience.